Eusteralis stellata grof is a relatively new plant that is being introduced to the hobby. 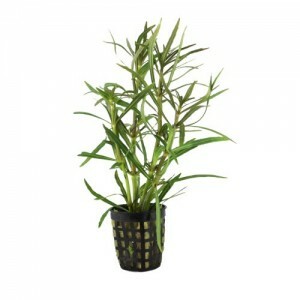 This plant has very strong, architectural stems that grow in a pretty straight manner. 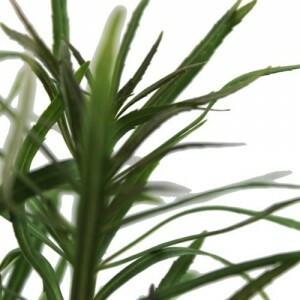 This plant has thin green narrow leaves with serrated edges. The underside of the leaves have a purplish hue to them. If Eusteralis stellata grof reaches the surface of the aquarium do not be surprised to find blooms of small white flowers appearing on the emerged stems. Whilst this is lovely when flowers show it can hinder the growth of the plant so be aware of this. This plant is native to Japan, China, Taiwan, Malaysia and Australia. 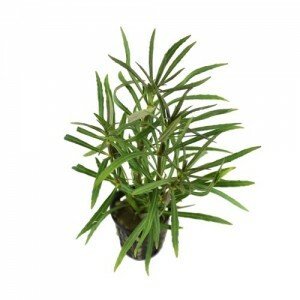 This plant is best suited to the back of the tank as although it is a slow grower it can get quite large. Eusteralis stellata grof is a demanding plant and requires a nutrient rich substrate. This plant performs at it’s best in soft slightly acidic water. When planting separate the stems, do not plant stems together in a tight bunch. This will ensure that all stems get adequate light at the base and none suffer from light deprivation. Do not use sand as a substrate with this plant as sand holds absolutely no nutrient value which this plant cannot tolerate. This plant will also need strong lighting. Eusteralis Stellata Grof has been known to stall in growth mode but simply replant and this will kick start the growth. Finally this plant will require CO2 injection and the use of a good quality fertiliser such as Neutro + to be used in conjunction with CO2. Propagation is simple – you can “pollard” the stems once they are big enough and simply replant into a suitable substrate and they should start to root. Takashi Amano has done it again and boy can this man think big when it comes to planted aquariums. It’s TRULY HUGE! I mean, when most hobbyists think about planted tanks, they think, maybe a few hundred litres and if they’re thinking big, 1000L right? Well that’s a drop in the ocean compared to this beauty. There’s a lot you can learn from this type of aquatic tank, in terms of how he plans the layout and then implements the plan. It really is impressive. How do the best just get better? In this case, they go bigger, MUCH BIGGER than the competition and this is just what Takashi Amano has done again. You see, no one can really touch him now as he has become such a powerful and dominant world leader in aquascaping. Most don’t even have the access to the large stones and the tanks and the team required to pull these sort of tanks off. So sit back, and enjoy. Make unexpected mistakes even after thorough consideration. In Japan they call this Senryo Isshitsu – Make unexpected mistakes even after thorough consideration. I love the honesty of it. We all make mistakes, even the best of us. I’ve always said that Takashi Amano is the best scaper in the world and some things never change. In this clip below you can see the master working his magic with his rather large team! My good friend George Farmer has demonstrated just how you create a planted aquarium with just one pot of Micranthemum ‘Monte-Carlo’. This is no easy task and unless you have A LOT of experience, do not try this at home. I always recommend a high plant mass from the beginning for creating balance, but if you know what you are doing, you can experiment. So take note, replicate, rinse and repeat. Do as George says and you shouldn’t go far wrong. Ok, so having a well-run aquarium may not impress people as much as sports car or Hurligham Club membership, but historically the keeping of fish has been seen as a cultivated activity and one championed by the wealthy elite. In ancient Rome, around the first century BC, having fish ponds became popular and the rich politician Lucullus was known for his extravagant waterworks where he used intricate canals to mix salt and fresh water. He used to put gold rings in the fins of his fish to make them look smarter. Unless you have a full sized aquarium in you home filled with lemon sharks and seahorses, you are unlikely to drastically alter anyone’s opinion of yourself in the 21st Century, but a well ordered aquarium, much like anything else, is indicative of a well ordered mind, and it will prove that you are a person with unique and interesting tastes. Aquariums have long been seen as a relaxing edition to any environment and it is believed that spending time tending an aquarium and sharing a room with one can lower one’s blood pressure and generally reduce thy symptoms of stress. Owning an aquarium is a great way to educate yourself as well as friends and family about sensitive habitats and the kinds of creatures and plant-life that live within them. Children enjoy aquariums as much as adults and, especially as we currently know more about the moon than what lies beneath the oceans, it is a great way to spark a lifelong interest in children or young relatives who might be overly interested in watching TV and playing video games. It is the wonderment created by well-run aquariums and zoos that can actually boost conservation efforts by reminding people just how beautiful and amazing the world outside the cities really is. The first thing to remember is not to go too small. Many people starting our will get one of these small aquarium packages thinking that they will be low maintenance but, because the volume of water is smaller, it means that the key water parameters can change very quickly and there is very little margin for error. If you are concerned about what size of tank might be appropriate for where you live, remember that if you are renting a property your landlord may have put something about pets in your contract – which could technically extend to fish. If you are interested in information on finding your own place where you can have all the tanks you want, get onto a website like Rental Yield, it will be worth it. You should wait before adding the fish to your tank, giving the water time to stabilize. There will be many gasses, minerals and chemicals present in the water at first that will need to balance out. It is also important not to start with too many fish. Most aquariums will depend on certain bacterial colonies being present, and they need to grow until a full colony can be supported. Make sure you research which fish go with which and what kind of filtration system they need. There are a while variety of little skills one need, such as a proficiency at being able to test the aquarium water and a sense of organisation regarding feeding times. These can be learned easily enough. The most important thing to know is that there are many places, such as Aqua Essentials, who can provide assistance and advice for those looking to get started in this interesting and therapeutic pass time. Still think goldfish are boring? Whilst it’s not normally our cup of tea, I love this short YouTube clip by Aquarium Design Group. This tank I find is totally inspiring – partly because goldfish were the first fish I ever kept and I remember watching them for hours on end. They’re always so busy – unlike some tropical fish. What do you think? Want a goldfish tank like this?